Where Will the Invasion Take Place? Goal for Summer 2018: Launch the New Version of the Website! Annie: [00:00:00] This is Join Us in France episode 201. Bonjour, I’m Annie and Join Us in France is the podcast where we talk about France, its many quirks,, its history its language, and of course, destinations in France you want to learn about because hopefully you’ll be visiting soon. Annie: [00:00:19] On today’s episode I talk to Phil Roberson about the history of Operation Overlord or the liberation of Normandy. We discuss how the allies prepared and how these events went down and led to the liberation of Paris and France. Annie: [00:00:35] So if you’re going to Normandy and you want a refresher about all the things related to D-Day that happened there this is the episode for you. Annie: [00:00:44] And when I want to scare myself just a little bit, I think how the 20th century and how my own life as a French person would have turned out so differently without what the allies did to liberate France. I can never express how much I appreciate what these people did and I know my fellow French citizens feel the same way. Annie: [00:01:08] I had the privilege to see D-Day celebrations in Normandy in 2018 and it was outstanding. I won’t go into it in this episode because it would make it too long, but I’ll talk about it at length on some other occasion. Annie: [00:01:24] When Phil and I recorded this episode we somehow managed to overlook a really important part of Operation Overlord that happened in Arromanches-le-Bains. So that’s where the artificial harbour was, also called Gold Beach. 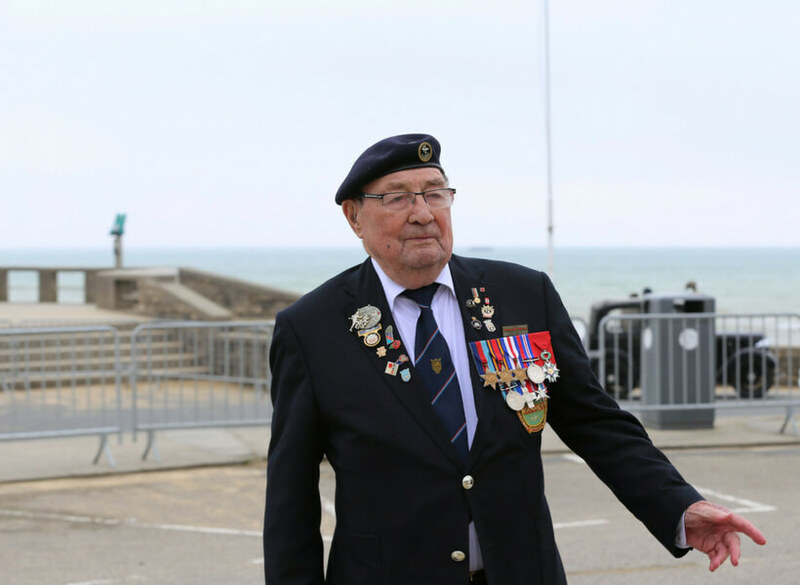 Phil realized it within a few hours and called the voice mail and left a really interesting explanation of what happened at Arromanches-les-Bains. So you’ll hear that right after the end of the interview. Annie: [00:01:54] If you’re interested about the history of the Battle of Normandy you should also check out Episode 18S D-Day history Normandy Invasion special. Elyse and I published this episode at the beginning of our podcasting journey but the information is still as true and relevant as ever. Annie: [00:02:14] I will also play some feedback from Steve. At the end of the episode where he talks about how much he enjoyed the episode about food prices in French grocery stores that was Episode 197. I should have played that feed back several episodes ago, but as busy as I’ve been it just fell through the cracks. Annie: [00:02:34] You can also leave voice feedback by calling 1-801-806-1015. I’d love to get more voicemails, you know, about maybe a restaurant you liked in Paris, or a hotel you loved, or some activity you found out about that you want to share with everyone. It doesn’t have to be super long but it would be good to have your feedback in with your own voice. It is after all a podcast! Annie: [00:03:02] Show notes and photos for this episode are on https://joinusinfrance.com/201. Annie: [00:03:10] Join Us in France is brought to you by Patreon supporters and Addicted to France, this small group tour company for people who want to enjoy France to the fullest with zero stress. We have a sold out tour coming up in September in the Dordogne. And Elyse and I will get together soon, as soon as we both you know actually stop traveling and we can get together in the same room with a cup of coffee and decide on new dates and possibly new tours. I will keep you updated. Annie: [00:03:43] Join Us in France needs your support to see all the way you can support the show. 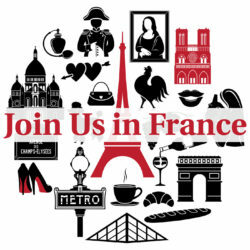 Visit https://joinusinfrance.com/support. Annie: [00:04:24] Hello Phil and and welcome to Join Us in France for you third time! Phil: [00:04:29] Bonjour Annie, I feel very honored to be on the podcast again! Annie: [00:04:33] Bonjour, it’s lovely to have you. We’ve been discussing doing an episode together about the Battle of Normandy or I guess Operation Overlord is another name for it. And I’m very excited to have you on because this is something I know a little bit about but not enough to really conduct a full episode on it. And so, it’s lovely to have you. 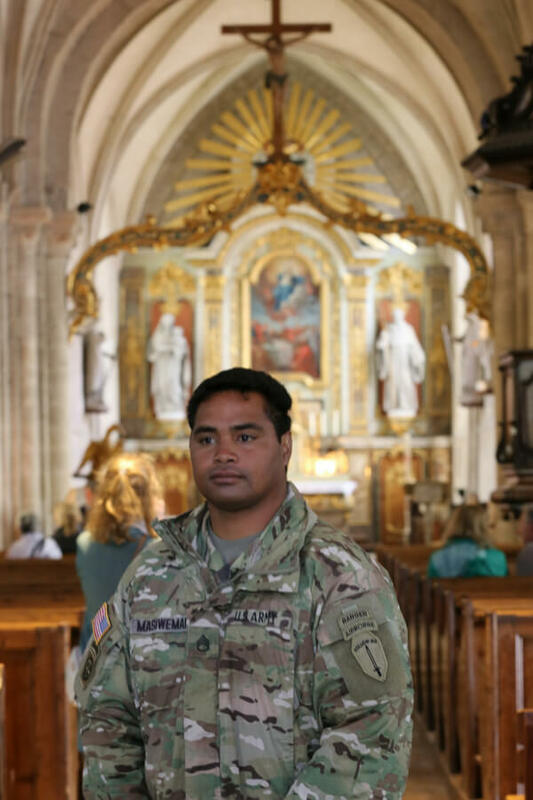 Could you introduce yourself a little bit and tell us why you so interested in Normandy? Phil: [00:05:02] Sure. Well first and foremost I’m a huge fan of Join Us in France So mentioning on a couple times and listening to almost every episode. Annie: [00:05:10] Thank you ! Phil: [00:05:10] But I’m an amateur historian I’m not a professional but I’ve got a real interest in World War Two in general and particularly the battle of Normandy. I’ve I’ve been over there seven times five of which were on the anniversary of D-Day. Annie: [00:05:24] That’s a lot more than me, by the way! Phil: [00:05:24] Well, and and I would go back this year if I could but I’m certainly going to go back next year when it’s the 75 year anniversary. Annie: [00:05:32] I’m going this year. Ha ha ha ha ha ha ha! Phil: [00:05:35] Well, you’ll have to send me pictures! Phil: [00:05:37] I’ve got an interest in skydiving as well and I think that’s one thing that got me originally interested. I had a boss who was… When I was a very young kid. He was a paratrooper on D-Day and his first combat ever was jumping into German occupied France in Normandy. And I think that got me interested in both parachuting and in Normandy. Phil: [00:05:56] And I went there once to kind of check it off my list and found that I fell in love with the whole area for a lot of reasons other than just the history of World War 2. So I’ve been back a number of times and I’ll go back again I’m sure. Annie: [00:06:08] Very cool. That’s lovely. Wonderful. And you also in your notes here you talk about volunteering at a museum in Massachusetts. Phil: [00:06:18] Yes. It’s a wonderful museum in Massachusetts that so many people don’t know about. 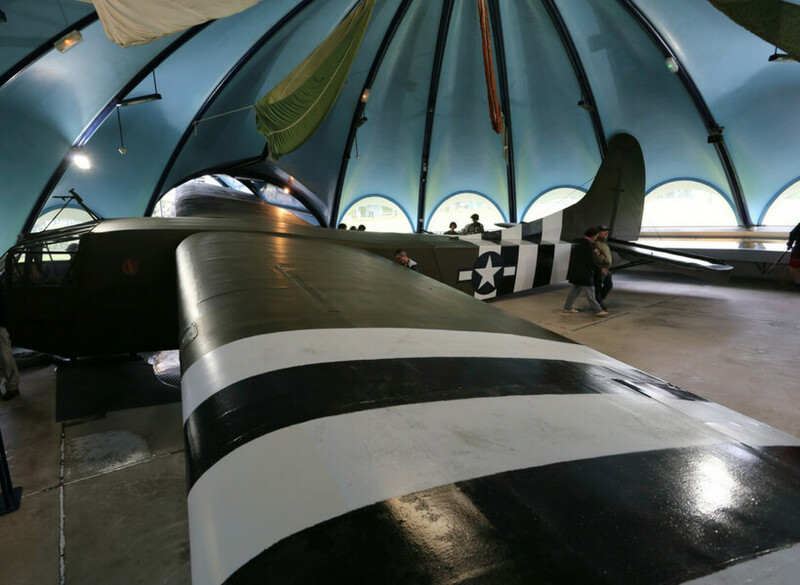 But as one of the most amazing collections of artifacts from World War Two in general, and certainly the Normandy area as well. It’s called the International Museum of World War II. And I think their Web site is http://museumofWWii.org [It’s .org not .com] and they’re they’re at capacity and their current building. So they’re actually in fundraising to create… Build a new building next door and kind of expand it. But it’s a great museum and I volunteered there videoing lecture series which is mostly veterans of World War 2 that will come in there as well as some historians. And I go there whenever I can in my spare time. Annie: [00:07:00] Very nice. Very nice. OK. So let’s get into this into D-Day and what happens specifically on that day. Phil: [00:07:08] OK. Well let me first clarify that D-Day was June 6 1944 and it sometimes equated with the Battle of Normandy but really did it was just the first day of the Battle of Normandy and the Battle of Normandy is generally considered until they went entirely through the peninsula and liberated Paris in August 25th. Phil: [00:07:28] So it was a you know two and three month battle to take that whole area. But D-Day was, you know, the first assault on German occupied Europe. Well, I shouldn’t say that! There were actually some assaults in the south in Italy. But this was the first major major offensive. Annie: [00:07:45] Right they had done Italy and to North Africa first. Phil: [00:07:51] Algeria, and they had done a lot of tank battles with some of the same people they met in Normandy and in Africa. And it was the largest. It still is the largest amphibious attack in history. Hard to imagine that there will be a larger one today because a lot of it was based on secrecy and disguising just huge quantities of men and vehicles at naval craft and aircraft. I can’t imagine you’d keep that sort of thing secret these days with satellites and Internet and things like that. Phil: [00:08:22] Because it really although the Germans expected the allies to attack at some point and probably in Northern Europe they weren’t sure when and they weren’t sure where. So they had to kind of spread their defenses everywhere. And had they known when and where they probably could have defeated it at the shore. And there was a very famous book called The Longest Day. And I believe that phrase was came up from General Erwin Rommel who is a German commander in charge of the defenses of Normandy and he thought that the battle would be decisive at the shore. Annie: [00:08:56] Right, I remember that, yes. Phil: [00:08:58] And that day would be the most decisive and for everyone involved that would be, in his words, The Longest Day. So I think when we talked today about D-Day and the battle of Normandy I think would probably do is just confine things to D-Day in the first week or two afterwards which is when Allied forces started pushing inland. Phil: [00:09:41] America didn’t really get involved although there was a big push to get involved. But there was a lot of resistance too. And America didn’t really get involved until the Japanese attacked Pearl Harbor in December of 41. And then we declared war on Japan immediately and then Hitler, which was kind of a strategic mistake on his part, declared war on the U.S..
Phil: [00:10:04] The U.S. had not declared war on Germany. And like I say there was some resistance. There was a lot of Germanic people in the U.S. It was easily, racially, to look at the Japanese as a different people etc.. And once once Germany declared war on us, you know, all bets were off. 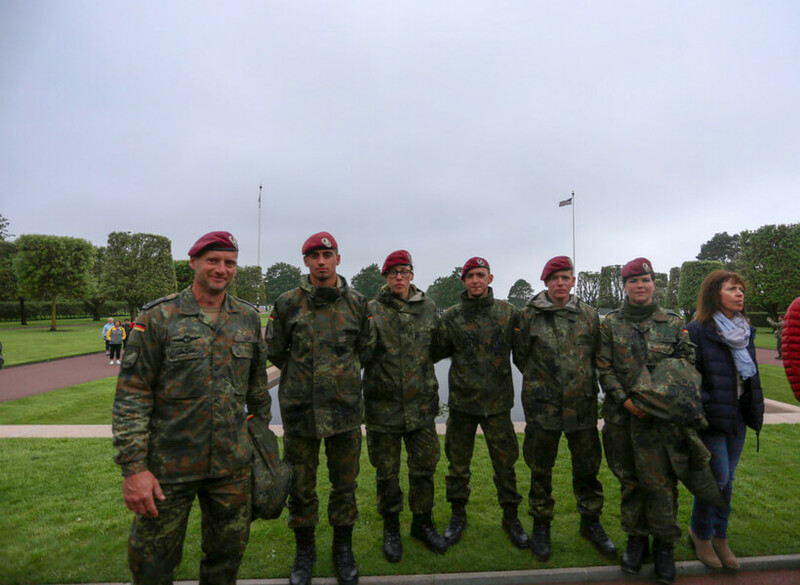 Group of German Soldiers visiting the American Cemetery at Colleville sur mer. Germany has come a long way since Operation Overlord! Photo Annie Sargent. Annie: [00:10:22] Yeah there is no way you could say we won’t defend ourselves. Phil: [00:10:26] Exactly. Exactly. So by early 1944 Germany had occupied most of Western Europe. Phil: [00:10:34] And they certainly occupied France, although their occupation of France was somewhat split between complete occupation forces in the north of France, and the Vichy government which pretty much controlled, under German rule, the south of France. Phil: [00:10:52] And Vichy France was considered, you know, the collaborationist government. Phil: [00:10:55] Although Some would argue that they were just doing what they had to do to survive. Annie: [00:10:58] Well that’s one way to put it. Phil: [00:11:01] Doesn’t everybody in war? Phil: [00:11:05] So the major allies against against Germany were the United States, England, and Russia. And there was a whole bunch of others as well but those were certainly the largest countries. And England and Russia with a lot at stake. Because, you know, England in the Battle of Britain if Germany wasn’t contained they fully expected the Germans to invade over there. Russia were was fighting Germany in the east and suffered huge losses. But both countries suffered huge losses. It is hard to fathom the scale of death and destruction on the eastern front. And I want to know a lot about others and it was huge. Annie: [00:11:41] Yeah, yeah. It was bad. Annie: [00:12:08] Right, to be busy somewhere else. Phil: [00:12:10] Yeah. And many people would say that that Hitler made a huge strategic error trying to battle everybody at once because he said you know in the end he simply couldn’t. He had started with Russia as an ally and then attacked them. So. Phil: [00:12:24] So that’s kind of where the world and where Europe was at least in early 1944. The U.S. had been building up forces in England in anticipation of a major offensive. I think there were about a million and a half soldiers in England. Phil: [00:12:42] Just kind of poised and ready and waiting for the plans to develop for a major attack. France as we mentioned was under occupation. Although there were some people that were out of France that were willing to fight with the allies. But, occupation meant, well war meant, rationing of everything. Phil: [00:13:02] Cause war is expensive so you have to ration food clothing fuel tires petrol. I mean you name it. Phil: [00:13:21] Or a half pound of butter or some sugar. Everything you wanted to buy you you had to have one of these coupons. And it’s easy to imagine. Of course I wasn’t alive back then. But it’s easy to imagine that in places like England and the U.S. there is at least patriotism that well we’re doing without some of the boys on the front can have what they need to to win the war. I’m imagining that in France it felt very differently, because if you’re doing without it means you’re giving more food and material to the people that are occupying and oppressing you. Annie: [00:13:50] It’s true, that’s who’s taking it. Phil: [00:13:53] So, you know, like everywhere in war there is a huge black market and things. Normandy, as far as food went, did a little better than the rest of France because Normandy’s a huge food producing region. It’s a dairy region, apple region. You know there are farms, there’s vegetables. So it’s it’s easier to divert a little butter or a bushel of apples or something without anyon noticing than it would be in a city where you have major distribution networks and everything’s counted and measured and allocated. Phil: [00:14:26] So, you know, the Normand citizens did without a lot and I wouldn’t say they were eating great but they’re eating better than their Parisian counterparts. And also I think the occupation forces there were a little… Most of the French didn’t want them there, but for a lot of the Germans, it was kind of a good place to be. There was no battle at that point. Annie: [00:14:48] Right. There was no… Yeah. Phil: [00:14:49] They could have been on the Russian front. Instead they’re living in this nice farmland and eating fairly well. Annie: [00:14:57] That’s a good point! Phil: [00:14:57] They would requisition whatever they need, including men to build their defenses. You know, buildings. If there was a nice civilian home and the generals there and they need a headquarters. You know, we’re taking this home. Phil: [00:15:11] That’s Part of the occupation which happens everywhere, but had to be particularly ugly there. Phil: [00:15:15] You Know. So the allies really needed to invade. And I use that term loosely, but had to attack German occupied France. And the question was where? England was the staging grounds for most of the men and material. And that’s where the U.S. kind of used its European base because it was really an island within Europe that it wasn’t invaded. Phil: [00:15:38] England themselves really pushed for something in the south of France and you know going up there south of France or Italy. And I think that they were just more fatigued and had war at their doorstep. They had German planes bombing their cities and they really wanted to push things away from them rather than have it right on their doorstep. Phil: [00:15:57] But Northern France made a lot more sense logistically. You have to get all those people across the ocean and across the ocean in the north of France means across the English Channel which is relatively close. Also you’re closer to the heart of Germany and it’s closer not just for the initial attack but also to resupply. Resupply the men and material you have on the ground. Phil: [00:16:21] So if you look at a map between England and France the logical place to attack or to to get a lodgment in the continent would be the Pas de Calais which was the closest point across the English Channel to England. Annie: [00:16:56] And also, Pas de Calais was British for the longest time on and off. Phil: [00:17:03] Oh, is that right? Annie: [00:17:04] Yeah that part of France belonged to the English for the longest time. Phil: [00:17:08] OK, well so and again so that would seem very logical. It’s less distance to travel, it’s core, it’s closer to Germany etc.. In fact the Allies had a deception plan called Operation Fortitude. And this was, there was actually two parts to it, but they were two fictitious completely fictitious armies based in England. One to the north that they made it look like they’re going to attack Norway and one in the south. Made it look like they’re going to attack Pas de Calais. Annie: [00:17:37] Wow that was smart. Phil: [00:17:38] It was smart I was. It’s amazing how thorough that was too because they had… You know, you have to pretend there’s masses of men and materiel Army divisions poised to strike. So that included things like fake tanks, fake landing crafts, buildings, even things like radio traffic. That wasn’t your top secret radio traffic but just the type of logistical things you’re apt to hear when an army is on the move. You know, You have to get this many tons of food and this much gasoline and also they had all this radio traffic going nonstop. Phil: [00:18:12] And even after the attack into Normandy they kept it going hoping, and successfully hoping in some ways, that they could convince the Germans that the Normandy assault was really just a diversionary tactic. And in fact after June 6th, for quite a while, they kept a lot of tanks around Pas de Calais because many generals and Hitler were convinced that that was that was just a fake. That they were really coming for Pas de Calais and you needed to keep those tanks there. Annie: [00:18:37] This is just crazy but they got attacked in Normandy and they’re insisting on keeping a lot of assets in the Pas de Calais. Like…! Phil: [00:18:47] And a lot of field generals for Germany, they knew what was going on. They disagreed, but the higher ups, but you know, disagreeing in Nazi Germany wasn’t something that was, you could just disagree and get your way. Phil: [00:18:59] And in fact those tanks by the Pas de Calais were under the direct control of Hitler. They were not allowed to move without strict authorization. And in fact on June 6th when Rommel called for tanks for a long time the request didn’t even get to Hitler because he was sleeping. No one would dare wake him. Phil: [00:19:20] And so, you know, there’s a lot of… When you’re a megalomaniac that comes with a lot of faults and some of which is just controlling everything which doesn’t really work well in a large… In a large army. Phil: [00:19:33] And also the first U.S. Army Group, which was this traditional group in Operation Fortitude, was supposedly headed by General Patton. And Patton was already really well respected. Everyone thought that he would be the logical allied commander for an army assault on France. He had been successful and in Africa. So the Germans thought he would be too. He was actually somewhat sidelined for political reasons. So there was a great place to put him in charge of this army and everyone think that we’re attacking Pas de Calais. Annie: [00:20:06] Yeah, that was it, yeah! Phil: [00:20:07] So. So that’s 1944. 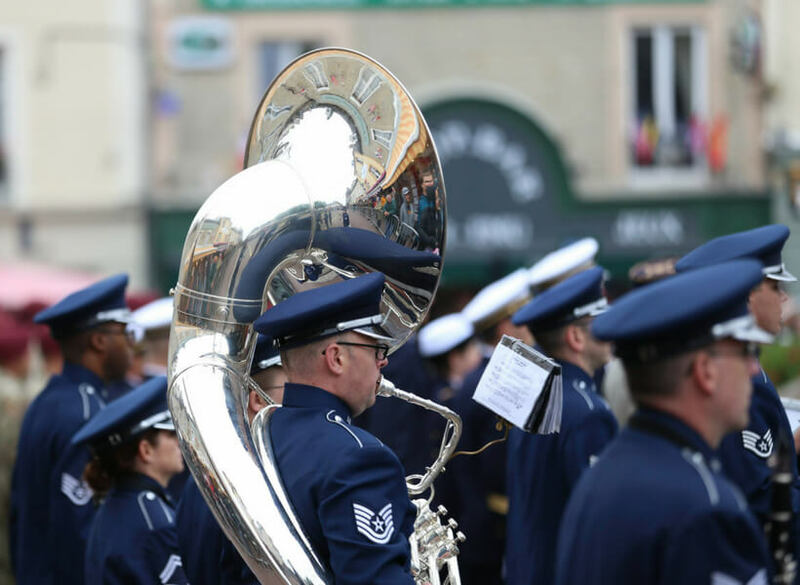 You know one question comes up: why was D-Day when it was? And some of the main reasons are weather related. So this was a huge amphibious landing and they needed the perfect combination of an extremely low tide, at dawn, a relatively calm seas, clear skies for the paratroopers and a full moon some paratroopers can see. Phil: [00:20:31] And the original plan that they made 43 was to attack on May 1st of 44 because that had those perfect weather conditions. But that attack ended up growing and they added a fifth landing beach and that meant more landing craft and more supplies. And so the whole thing was pushed off actually to June 5th which was next in perfect conditions. Annie: [00:20:53] Right, it was really interesting to me in the longest day, in the book, how he explains that they had to meet requirements and that these requirements sometimes they weren’t there and… And that even the Germans were thinking, oh for sure they’re going to attack now because the weather’s great, like… And then they didn’t! They were like, oh, what’s going on? Phil: [00:21:12] Yes. Like you say there’s a lot of requirements and everything has to come in come in to plan perfectly. And bad weather on the 5th meant that it was really untenable to try to do a vast cross island assault. Annie: [00:21:27] Right. So a low tide what had to do with the fact that the Germans had installed so many defenses in the sand. Annie: [00:21:37] And that you know any boat going over that low water would blow up. Exactly. Phil: [00:21:43] And actually the Germans expected the allies to attack at high tide because there’s less beach to cover at that point. Right. And they’ve got all these obstacles that would be buried at high tide and these were you know poles tipped with mines and these huge cross iron structures that would just rip up landing craft. The allies thought completely differently. They thought well because of those we have to attack low tide when we can’t see them destroy them. Phil: [00:22:09] So, you know, low tide wasn’t expected. Right after a storm wasn’t expected. So that definitely worked in the Allie’s favor. And eventually even after a slight false start on June 5th, they chose the date of June 6th and it wasn’t perfect conditions but they were worried that if we don’t do it now we have to wait a month and a whole month runs the real risk of the entire invasion being discovered. Phil: [00:22:33] By spies and things like that. By that point the Germans could bring the tanks to the shore and could likely have defeated it. It was not a sure thing that going in, that we would be successful. Annie: [00:22:46] Right. And waiting a month had to do with the moon because they needed. Yes they needed the light of the moon to. Phil: [00:22:53] And I think the moon also affects you know how the tide cycle. Yeah how extreme they are. Phil: [00:23:00] So yeah. June 6, it would have been July. So Dwight Eisenhower, who was the supreme commander of the Allied Expeditionary Force, you know in the end he got opinions from his generals but it came down to him. He said we’re going to do it. Bernard Montgomery was in charge of the ground forces. He was a UK general who was also very successful in Africa. He went for it. The Air Command was a little less enthusiastic and the naval command as well. But in the end they decided June 6 was the day. Annie: [00:23:35] And they decided right at the time. I mean it’s not like we decided two weeks before. They decided right as it was coming up. Phil: [00:23:43] Yeah, I mean, they had a date a year before. That got pushed off a month. And then that gets pushed off, like you say. You know, the night before you have to, you have to go. And they had the men in the ships in the channel because it takes a long time to load up that many ships. So they were ready to go. And there was the other question of if you have to take them back and refuel, now you’ve got to unload the ships, reload etc. Phil: [00:24:03] And the scale of this attack was just amazing. We’ll talk a little later about the numbers involved. Annie: [00:24:10] It’s amazing, it’s amazing how much was involved. Phil: [00:24:14] So the the attack itself. Like I said it was mostly the U.K. and the United States. The Russians had their hands full in the east. But it was also Canada was a large part of it. There were some forces from Australia, New Zealand, and up many forces from some of the smaller countries that have already been occupied. But the soldiers escaped before occupation. So there were soldiers in Belgium, Czechoslovakia, Denmark, many free French were involved, including paratroopers. The Netherlands, etc. Norway, Poland, a lot of Polish soldiers there. Phil: [00:24:49] And in fact when you go to Normandy today you see some of the British cemeteries. The U.S. cemetery only puts U.S. soldiers there, but the British cemeteries puts people from various countries including some Germans. But you’ll see a lot of headstones that are a little different and they are for Polish soldiers or Norwegian or Greece, Greek soldiers, etc. Annie: [00:25:08] Yeah yeah because they don’t have, I mean, they didn’t lose enough people to have a whole big cemetery to themselves. Phil: [00:25:14] Yeah. Yeah. And a lot of times the you know the occupied country soldiers were really working under the command of the three countries as well. 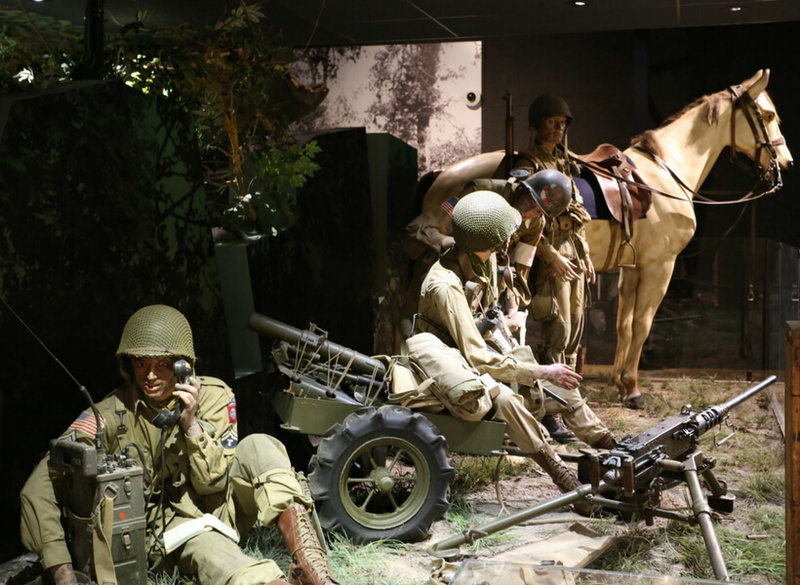 Phil: [00:25:24] So Normandy itself, again, the Germans didn’t know exactly where the attack was coming. So they basically had to try to protect from northern Norway all the way down to Spain on the Atlantic which is 2000 miles of coastline. And, you know, Hitler had what he called his Atlantic Wall that he claimed was an impregnable to an attack. And it was, you know ,quite daunting it was a huge construction project. They used mostly slave labor and POWs and constricted French civilians to build it. I think less than 10 percent of the Labor actually came from Germany. But there are over a quarter million men involved in building this. Phil: [00:26:05] And, you know, there was there were gun emplacements—huge gun placements you know. Concrete, steel reinforced concrete. Some of the guns were huge in and located inland but they had forward arms observers on the coast so that they could reach many miles out to sea and take out ships. Annie: [00:26:24] Right. And you can still see some of them… You can still see some of the construction that those guns were in. Phil: [00:26:30] Oh yeah. Yeah. Lots of the construction there have they. I read a spec that there are 17 million metric meters of concrete poured for the Atlantic wall, and one point two million tons of steel. And those just don’t go away overnight. So there’s going to placements there are large ones, small ones. You walk near the beach and you may see a small machine gun turret, you know with a pit that a man could be inside you know just poking its head over the top. And you see gigantic gun emplacements with concrete many meters thick. Phil: [00:27:02] A lot of the ones that were set right on the coast the larger guns were actually positioned crossfire so that they could use a cross-fire pattern so they had overlapping fire. So it was… You got behind one obstacle to get away from one gun, there was another gun that could see you. And the openings for these guns didn’t point out to the sea and were invisible from the city. So they’re very hard to attack from the Navy. And It made it made the beaches just treacherous right. Phil: [00:27:32] And as you mentioned you know various contraptions on the beaches, they had mine tipped poles and these things called Belgian gates. You see pictures back then at low tide. It is not a beach you want to go to. Annie: [00:27:44] Yes yes I do have some historical pictures of that. I’ll try to put them on the show notes. It’s… It’s frightening how much… They turned the whole place into just a war field, you know. [00:27:58] A fortress! Yeah, he called it Fortress Europa was Hitler’s term for Europe in general. Yes. And even in-land on some fields that they thought they could land planes or gliders, they planted these things called Rommel’s asparagus. And when Romney was in charge of the defense they be these huge poles that just stuck up out of the ground so that a glider that came in would just be ripped apart by it. There’s no open way. Phil: [00:28:24] And anyone from Utah Beach they there was a lot of low land that was drained through a series of dikes. Well they ended up reversing those dikes and actually flooding the areas so that paratroopers or planes couldn’t land there or they did that they would drown. So Erwin Rommel with the German general in charge of this, and when he came in charge of it he found the defenses lacking and really ramped up construction. And there’s another theory that had they had another month or two to build up these defenses that would have been even more daunting. Phil: [00:28:57] So behind the defenses was was Normandy. Which is a beautiful rural area with rolling hills small farm fields, even smaller fields that you see today because a lot of the smaller fields have since been opened up into larger fields for mechanized farming. But all these little fields little villages with you know a church and a few houses around it. A few of the larger towns like Caen and Bayeux were really the hubs, the transportation commercial hubs of the areas. One other thing, I think we kind of mentioned this, but Normandy in general, not just based on the moon, has an extreme of high and low tides because of the narrowness of the channel. Phil: [00:29:37] So you know the tide when it goes out it goes away. You know if you go there today that low tide and you look how far somebody would have to land a landing craft and get all the way to the shore. It’s a long distance. And I will say that most of the beaches it was just gently rolling behind the beach, but Omaha iself had very high bluffs overlooking the beach. Phil: [00:29:59] So that gave the Germans a strategic advantage. The only way to get a vehicle off the beach was one of 4, they called them draws or exits from the beach. So this is really the only way for vehicular traffic off the beach. That was, you know ,the plan was we need to take we need take these exits. Phil [00:30:17] So Omaha Beach had hills, Utah beach had flooded areas. Although the Germans weren’t totally expecting it there, they did have huge garrisons and men, and behind them the German citizens… The French citizens most of whom had been moved out of the immediate coastal area. But there was, you know an active French Resistance in everywhere in France but certainly in Normandy. Phil: [00:30:40] And I think you’d sent me some notes, you did some research on the French Resistance. Annie: [00:30:43] Yeah, I did. You want me to talk about that now? Annie: [00:30:48] OK, you know, these are things that I didn’t really know myself. I mean you studied this in school in France, but it was extremely dangerous to join the resistance because the Germans were really ruthless in hunting them down and killing them right away. I mean it was like public execution you know bullet in the head in front of your wife and kids kind of thing. Annie: [00:31:16] And so it really scared people into only two to three percent of French people ever joined the resistance. Officially. There were a lot more who would help out as soon as they realized that they were dealing with a resistance group but that these groups were so secretive that they didn’t know each other’s names. Real Names. Annie: [00:31:39] Occasionally they happen to know each other from some other social,, school or something but they didn’t use anybody’s real names because they didn’t want people to be able to give up wo else was in the group if caught and tortured. Annie: [00:31:58] And they had they had very strange ways of working. So they had radio stations that would broadcast sentences. I mean, there were good French but they… It made no sense. So you’d have a guy saying something like “Monsieur Durand a perdu son vélo dans l’étang” which means Mr. Durand has lost his bicycle in the pond. And then they would pause for a second and then they would say and Madame… Madame I don’t know, whatever name “souhaite un bon anniversaire à sa belle soeur Giselle”. So Mrs. So-and-so wishes a happy birthday to her sister in law Giselle. And just sentences and sentences in sentences like this. And it was hard for the Germans to know what the heck they meant. Phil: [00:32:52] Probably because most of them meant nothing. Annie: [00:32:55] Right. Most of them were… It’s not. It’s like the classified. Maybe in a way. It’s like if you read like the classified, but every now and then, you put in there something that means something to one of these groups, right? And so they all they knew is that they didn’t know what the grand plan was, but they knew when I hear the sentence, you know, and this specific sentence that means this. Phil: [00:33:22] Whether it’s cutting a telephone pole or something like that. Annie: [00:33:24] That’s right. And so that’s how they communicated. And they had leaders who would pass around messages, but most of the time to the leaders themselves didn’t know what the message meant. They just knew that this is something they had to take action. You know when they heard that they had to take action. Phil: [00:33:44] And the other thing too is that I think most of these were broadcast by the U.K. It was illegal for French citizens to have radios. Phil: [00:33:51] You know the Germans want to control all communications. And so you know just having a radio in your house was a punishable offense, you know. Annie: [00:33:57] Yes, it was very dangerous. Phil: [00:33:57] Unless you had an old ones that were hidden, or ones you constructed yourself you’d leave up in the hay loft. The Germans would even patrol the area with these vehicles that were equipped to detect radios and radio receivers. And you probably wouldn’t be living there after it found one. Phil: [00:35:23] Yes. After the war after the war gave you stature. Phil: [00:35:46] Yeah. How many how many didn’t survive? We don’t know. Annie: [00:35:49] Well, they say that 40 percent of the people who joined were dead within the first year. Phil: [00:36:10] You can give me more information if you watch her… Being threatened, you know. Annie: [00:36:15] Yeah. No they were they were awful and. Well it’s war. I mean but. Yeah. Yeah. Those were very hard times. Phil: [00:36:22] Yes. So this was Normandy the way the allies and the German saw it in June of 44 and the final plan for assaulting the coast or assaulting Normandy. And I’m using the word assault rather than an invasion. I think I mentioned this to you before in the U.S. and I imagine the UK we refer to it as the D-Day invasion. But I found when I go to Normandy they find that term very peculiar because they didn’t see us as invaders. They saw us as liberators. Phil: [00:36:51] The Germans were the invaders and I’m sure we meant we’re invading German occupied Europe but the term isn’t used around Normandy. So I call it an assault or an attack or something like that. Phil: [00:37:01] Liberation is what they call it. Annie: [00:37:03] Liberation. But the thing is for the French soldiers who were involved in D-Day they had to shoot at their own country, you know. Phil: [00:37:19] Not easy for them. Annie: [00:37:19] Exactly. And you don’t know necessarily who you are shooting at, but you’re supposed to shoot at anything that moves I suppose. I don’t I’m not sure I don’t have any knowledge of how war works, but I’m assuming if they say, you know, take this area and shoot anything that moves, well, you got to do it. Phil: [00:37:35] Yeah there’s a house that they think maybe they’re Germans in, and maybe there aren’t maybe there’s some French civilians in they have to shoot at that or something. And yet the civilians suffered awfully when we talk about numbers a little bit later I think I have some numbers on how many casualties and fatalities they had. They actually had more… The French citizens had more casualties from the allied forces than from the Germans. Because, you know, we have to take a town and it was a French town and it was occupied by Germans. But that means we bomb it from the air. We use artillery on the ground. And the Germans weren’t in the town executing all the French there. They were trying to fight the allies coming towards them. So the French suffered huge. Phil: [00:38:16] And it’s it’s sobering when you go there to see that despite that, how much they respect the allies for what they did and for liberating them. Which has to point to how bad things were under German rule. Annie: [00:38:28] Yeah it was terrible. They really wanted the Germans out. Phil: [00:38:31] Yes. So the final plan to to attack the continent involved a number of things. There were almost 40 Army divisions as part of the attack. An army division is about ten to fifteen thousand men per division. There was over 7700 bombers, bomber aircraft. And really the attacks started the night before with a pre invasion bombardment by over 2200 of those bombers, and seven sabotage conducted by the French resistance. Phil: [00:39:02] Now in the weeks leading up to it there was a lot of bombing but they couldn’t specifically bomb Normandy because that would have played their hand. People would have known all that’s where they’re coming. So they had to bomb all over the country and try to strategically get places in Normandy. Phil: [00:39:15] On on the night of June 5th itself you know they concentrate all their bombing right there. So that was the first part of the plan. The next part of the plan is to have mine sweeping naval craft go across the English channel, because the Germans have the whole channel mined. And you got a clear path for the ships to go. And the plan was to attack five different beaches and they all had code names from west to east. They were Utah Beach and Omaha Beach which were the American Beaches. Gold Beach which was British, Juno which was Canadian and British and Sword which is British. And these beaches are about 50 miles apart as the crow flies. Phil: [00:39:56] There’s not really a road straight between them if you go between the beaches you usually have to go in-land to take a major road, then go back towards the coast. So it’s a gigantic area. And I will just kind of a side note: I sometimes see on forums people saying they want to go visit Normandy for a day. And it’s.. I always caution against it because you know it’s a huge huge area to see. There was a lot that happened in a lot of different places. And you can go to a couple highlights but you’ll spend most your day getting there and back and just so much more to see there. Annie: [00:40:25] Yeah. If you have a day, you’ll see maybe one of the beaches. 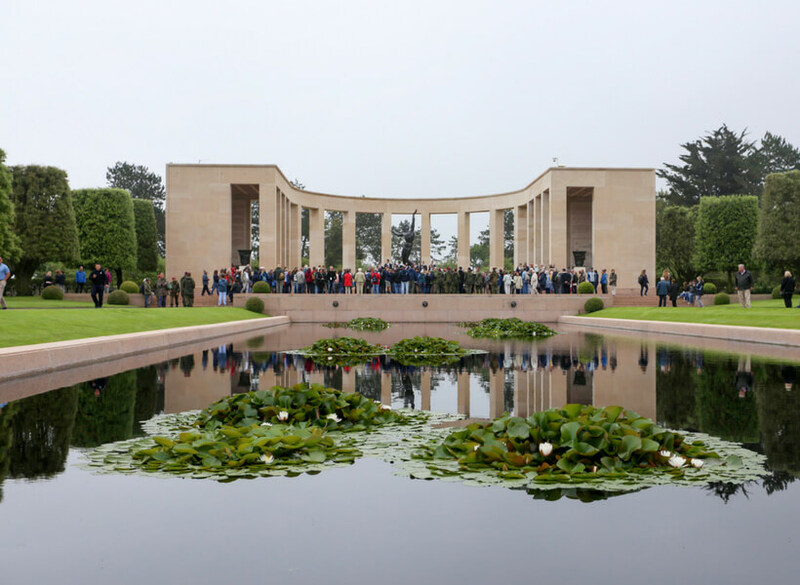 Or maybe one American cemetery or something. Phil: [00:41:02] Actually first these amphibious tanks, which believe it or not they developed, would land. And then this landing craft will land with engineers and they can start blowing up the obstructions. And then this infantry will come, you know four minutes later, and start going through. And then, you know, just all these minute by minute timing of craft and men. Phil: [00:41:23] And of course the night before, we back up a little bit, they dropped paratroopers. The plan was to drop paratroopers on the flanks on the east and west. So nothing inside of Gold Beach or Omaha Beach, but outside of Utah beach, and outside of Sword Beach, had Americans to the west and British to the east to protect the flanks. I think there were two American divisions and one British division, something like that. And they were really charged with protecting against counter attacks, capturing bridges, disrupting communications, and wreaking havoc. Phil: [00:41:57] And that’s just the initial attacks. You’ve got people hitting the beach the paratroopers holding the flanks and then you have to follow this up. You can’t simply, you know, put a couple divisions on the beach and say we occupy Europe. So the the constant battle for days on end is to resupply them. Phil: [00:42:12] And I just saw a couple stats I thought were very interesting. They estimated that in the first 20 days of the battle of Normandy they required 5000 tons of gasoline just for the trucks and tanks. And that’s what I thought was interesting because a requisition everything from food to tires. Phil: [00:42:29] Cots, medical supplies. 300 million units of penicillin. Wow. Now that’s just one little thing that somebody was in charge of requisitioning. Annie: [00:42:37] It’s crazy that all the planning that go into… That had to go into this. They had to line all these… Have all these ducks in a row. It’s you know perfectly right or it wasn’t going to work. And just the staging area in England must have been just mind boggling. Phil: [00:42:58] Yeah, they had these huge places where they put men and material and they called them sausages because on a map the bottom of them would be by the ports. But there were so many people you couldn’t put everything by the ports, so they extend well inland. And each little area,staging area, looked like a long sausage leading towards the port. Annie: [00:43:14] That is just crazy! Phil: [00:43:15] The logistics planning. I can’t imagine what that was like. Annie: [00:43:36] Email attachment that nobody ever saw or, you know, we went through a slack channel or something and then people missed. I mean it’s just just the management of the thing is… Just I can’t imagine! Phil: [00:43:49] It’s supply side economics I guess you’d call it today. Phil: [00:43:54] So. So that was the plan. Now here’s the invasion: one of the most dramatic things and one of the very first things happened in the invasion actually happened just a couple minutes after midnight on June 5th, and when I read about this I was just boggled. As an airborne consists not only of paratroopers who parachute to ground, but gliders. And these gliders were huge and they’d be loaded with men and material and they’d be towed across the English channel. And when they cut loose this, you know, multi ton thing would glide to the earth. Phil: [00:44:49] There were demolition charges, so if you couldn’t keep it. You blow it up. So your enemy can’t use it. And both sides would do that. So they knew they had to take this bridge and they had to take it really fast. So they crash landed these huge gliders about 50 feet or 50 yards from the base of the bridge. These British paratroopers come pouring out and within minutes they had this bridge. Phil: [00:45:11] Now they had to hold it of course against counterattacks and. People come from the ocean. But that was just an amazing first success of D-Day. Phil: [00:45:30] Yes. And you have to have good. Yeah. Both good plan and good soldiers and the paratroopers were certainly a level above. You know you got booted out of the paratroopers if you couldn’t pull your way. So these were definitely elite fighting forces. And I think Major was the was the name of the British commander in charge of this. I’ll have to look that up. But he and his men executed perfectly. Phil: [00:45:55] So shortly thereafter paratroopers landed to mark the… What they called Pathfinder paratroopers landed. Well inland to mark the landing zones for the rest of the paratroopers. And they used beacons, they used some lights. You know they couldn’t draw a lot of attention, but they had seen pretty at the time top secret navigation devices. Annie: [00:46:14] No GPS though! Phil: [00:46:15] No GPS and no night vision either. And shortly thereafter over 20,000 paratroopers descended from the air. You know under parachute and loaded with equipment. Some had over 100 pounds of equipment on them, which they learned later was you just can’t go walking around with a hundred pounds. Yeah that was a learning experience. Phil: [00:46:38] And unfortunately despite all the perfect plans, many of the paratroopers landed off target. Some even landed so far away as to land in ocean to die. Some landed right in the middle of a German installation, and were shot down or captured immediately, without having any battle. Phil: [00:46:55] And so that was really bad. The aircraft were scattered mostly because of ground fire and inexperienced pilots that you know you’re told to just fly steady and straight. But that’s probably very hard to do when people are shooting at you and things are exploding all around you. Annie: [00:47:09] I can’t imagine. Phil: [00:47:10] But some of this miss-drop actually had some benefit because it caused a lot of confusion in the German High Command. Because, you know, we get a report that there’s 10 men over here and we just captured these two soldiers here and they’re just all over the countryside. It was hard to look at it from the German perspective and say “Ah! They Are there trying to capture this town!” Or “this is their plan!”. And no-one had landed by the ocean yet. Phil: [00:47:34] And another part of this too is that the allies dropped two things: one was like this tinfoil type material that would confuse the radar. You just kind of see a cloud of radar activity, you don’t know what it is. And they also dropped these two foot high dummy paratroopers. And they weren’t lifelike or anything, but from a distance at night, you just see the silhouette of a parachute and a paratrooper coming down. And they’were rigged to have these fireworks go off when they hit command. When they hit ground. So, you know, you see things coming. They hit the ground there’s a bunch of gunshots. You think there’s a bunch of things. Annie: [00:48:08] They thought they were thousands and thousands of people. Phil: [00:48:14] And then the Germans would advance and find the dummy parachutists. Report that there were dummy parachutists. And then the higher commanders would doubt everything they’d hear. They’d go Yeah, I hear there are dummy parachutes being dropped everywhere. So, maybe a place where they were real paratroopers they doubted those reports. Annie: [00:48:29] Right, so they yeah, OK, it’s the dummy stuff. Oh my goodness! Annie: [00:48:38] That’s what they wanted to do. Phil: [00:48:38] Yup. Keep them off guard. So that’s kind of the initial airborne assaults. The next stage was the coastal bombardment. And they had all these bombers coming across a channel to bomb the coastal guns to kind of neutralize the German coastal defenses and allow us to get in. And unfortunately the bulk of these were ineffective. Because of an incident where they they bombed on their own people in Italy, they dropped bombs right on their own landing craft. The bombers were really reluctant. They waited a little too long. Some of them waited up the 30 seconds. Phil: [00:49:16] And you know if you’re flying an aircraft for 30 seconds you cover a lot of ground. Most of the coastal defenses simply were not hit on the night of D-Day. We thought they were hit, the people landing on the shore thought they were hit. But when they landed there they found out very differently. Annie: [00:49:31] Yes that they were functioning. Phil: [00:49:34] Yeah. And I think nowhere was this worse than Omaha Beach. Because some of the first landing troops to land were the, I think is was the 29th infantry division. There was a 29th and the 1st Infantry Division on Omaha Beach. The twenty ninth landed in the western sector, if I’m correct, and they hit that 6:30 AM and they expected to have amphibious tanks out in front of them. Phil: [00:49:59] This wacky British inventor had invented all these crazy modifications to the American Sherman tank. One was a tank that could float. Not well, but it could float and it had a propeller and if you dropped it off the landing craft the idea was get the tanks in to shore. An infantry works well with tanks and infantry follows behind the tanks the tanks take out the bigger emplacements. Phil: [00:50:24] Well the seas were rough and the commanders wanted to land the tanks too far out to sea. And these things went off the landing craft almost every one of them immediately sunk. They were just watching and come off when craft and sink and 27 out of 32 amphibious tanks in the American sector sunk instantly. So that the other one well and the other ones they got in but there’s only a few and there quickly bombed and pinned down by beach artillery. So they were just obstructions that point. Annie: [00:50:55] That was a big gamble. Annie: [00:50:58] Dropping tanks out of the sky is not an easy proposition. Phil: [00:51:02] I mean, tanks weigh tons and tons. They did better in the British and Canadian sectors, mostly because they brought them closer to shore there. And I believe the American ones that didn’t make it, the commander of the landing craft was ordered at gunpoint to bring them closer in, because the seas. The further you got out the sand, in the channel, the seas were rougher. Annie: [00:51:22] Of course, yeah. Phil: [00:51:23] All these carefully laid plans we talked about minute by minute landings, you know, tanks engineers infantry etc. quickly fell apart. And the very first troops that landed Omaha were just slaughtered. That very few were able to continue the fight at all. Some landing craft were blown out of the water before they get the shore. Men were shot just as a lot left the landing craft or on the way up the beach. 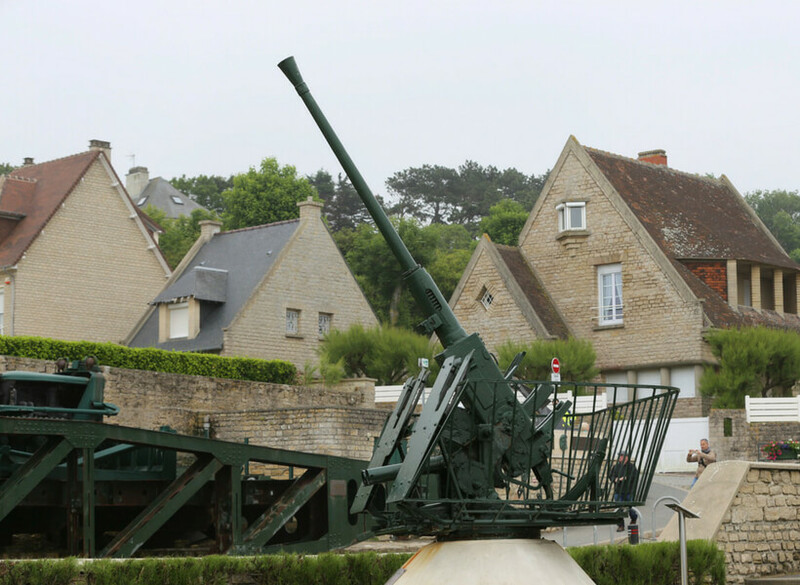 Phil: [00:51:47] These cross fire guns from the sides that blasted them on Omaha Beach just destroyed people. And it was just a shooting gallery for the Germans. And a lot of the men would go a long way up the beach. You get to the very high tide mark, is with what they call a shingles, just kind of a rocky area that, you know, the tide doesn’t go beyond there. And then it would move up to the shingle and from there they would be protected from direct gunfire. You know a few men deep could maybe hide and not get hit directly by a bullet. Phil: [00:52:18] But then the Germans had mortars that knew those locations exactly. And they dropped mortar charges right on top of them. So there they are sitting where they feel the safest you can feel. And in reality the longer you stay there the closer you are going to come to die. It’s just “un-survivable” at that point. Annie: [00:52:38] That’s so terrible. So What is what percentage do you think were killed of that first wave? Phil: [00:52:43] I’d have to look up on the 29th Infantry it was a huge percentage of that. The proper way to refer to them is casualties. Not necessarily killed. The casualty is killed, wounded, missing, or captured. Phil: [00:52:55] All it means is they’re of no use to the army any more. The army they don’t care whether you’re killed or not. But they want to know how many men they have that can continue fighting. Phil: [00:53:03] And the vast majority were casualties on Omaha Beach and particularly I think it was the dog [inaudible…] The rest of Omaha Beach. And I don’t I don’t know the exact number, but it basically, it ceased to exist as a fighting force. And the engineers were supposed to clear the obstacles were among those casualties. So now the tide’s coming in more reinforcements are coming in. The obstacles aren’t cleared. You’re piling up men and material on the beach. You don’t have the exits captured, which I think they expect to be captured within the first hour. And the beach quickly just got clogged. You bring a truck in or a tank you could get bombed. Now it’s just an obstruction. Or it can’t get through the other obstructions. You’ve got casualty, you’ve got dead men floating in the water, you’ve got wounded people up against embankments. Phil: [00:53:54] It looked extremely grim at Omaha Beach. And because of the fog of war the Allies out in the sea couldn’t really tell what was going on. They could tell it wasn’t going well. Everything was covered in smoke. They weren’t getting reports of anybody successfully taking their objectives. Annie: [00:54:13] Well, and they could certainly see that the Germans kept firing their guns and obviously those hadn’t been taken out. Phil: [00:54:20] And they were even told, you know ,don’t send anymore vehicles here because we can’t get off the beach. So all you’re doing is clogging the beach. Phil: [00:54:28] And they stopped delivering vehicles at one point in the morning and considered abandoning Omaha Beach because it just seemed like you were just sending men and material in to be destroyed and no success was being gained by it. They weren’t exactly sure. Out in the Navy but they discussed it. They discussed should we just stop this. There was no real plan for evacuation. You land on the beach you either succeed or you are killed or captured. But the only thought is keep more, you know, men from being killed or captured. Phil: [00:54:59] So it was terrible. And it was terrible for most of the day there. The other beaches did a little better. Well, did a lot better, but not to say they were easy walks in the park. There were a lot of German defenses there. Phil: [00:55:12] But the Canadians and the English largely got off the beach and did hook up with one another. Over on Utah Beach they actually landed in the wrong spot about a mile east or South Southeast of where they supposed to. Phil: [00:55:27] And there was a commander there who was general Roosevelt who was the son of Theodore Roosevelt. Who had basically, I think he was the highest ranking officer to land on the beach, and he talked them into doing it. He kind of embarrassed them saying you can’t tell an ex-president’s son that he can’t go in with the men. So he took charge there. Phil: [00:55:46] And, nor is it a question of well, do we tell the follow up troops to follow us or are told to go to the right spot? And he said, you know, we need to start basically his words where we’re going to start the war right here. And they had, you know, they had much less casualties. And they were able to overwhelm the Germans right on the coast. You know, relatively quickly. So the center of it, Omaha, was really the worst of all of it. And the fighting for Omaha really went on all day long. Phil: [00:56:17] They had… They couldn’t see these gun emplacements that well from out at sea silence and destroyers that sailed in dangerously close to the shore. Ran a severe risk of grounding just so they could fire directly upon these gun emplacements. Phil: [00:56:32] And it was, you know, if you ground your you’re dead. Because now you can’t move, they’re gonna shoot you. So the plan to take Omaha Beach by going out these four heavily defended exits just didn’t work. But gradually small units that got sick of being shot at or were encouraged by higher ups to, you know, assault up the bluff. Wouldn’t go up the road but would just climb these bluffs directly. Phil: [00:56:56] Two units here and, you know, ten people here and they slowly slowly got up the bluff and found that from behind, the Germans were defending the shore they weren’t covering their back that well. Phil: [00:57:07] So they were slowly throughout the day able to take the beach. It was at a huge cost and a huge loss. They did take it. They got up to the bluff, one part of the bluff is where the Normandy American Cemetery is today and you can look down from that cemetery and see, you know, if you look at low tide you can see how far out they were and how far they had to come to actually capture these. Annie: [00:57:31] It’s quite unfathomable that they did that. When you’re there and you try to imagine what happened. You like, what? How how did they ever think this could work? But it did eventually, at great cost, but it did! Phil: [00:57:48] It did, and it didn’t work exactly like they planned, but it worked through the perseverance of the individual soldier or the individual unit commander that would just keep pushing rather than giving up. Just try to find a way, and it was you know the innovation of soldiers. I’ve never been in the military but from all I’ve read, you know, plans always fall apart once the battle starts. Phil: [00:58:10] You have to have a plan, but once… Once it started you have to be adaptable. Those that were adaptable made it succeed. Phil: [00:58:19] So then you look back from the shore the airborne units. The British had captured the Pegasus Bridge and they eventually hooked up with the British coming in from Sword Beach. The Eighty second Airborne were were scattered, but landed with more precision than a lot of airborne. And they took this town called Sainte Mère Église which is a wonderful little town. It was not that big a town but it was kind of a crossroads for several important places and where they expected counterattacks might come. 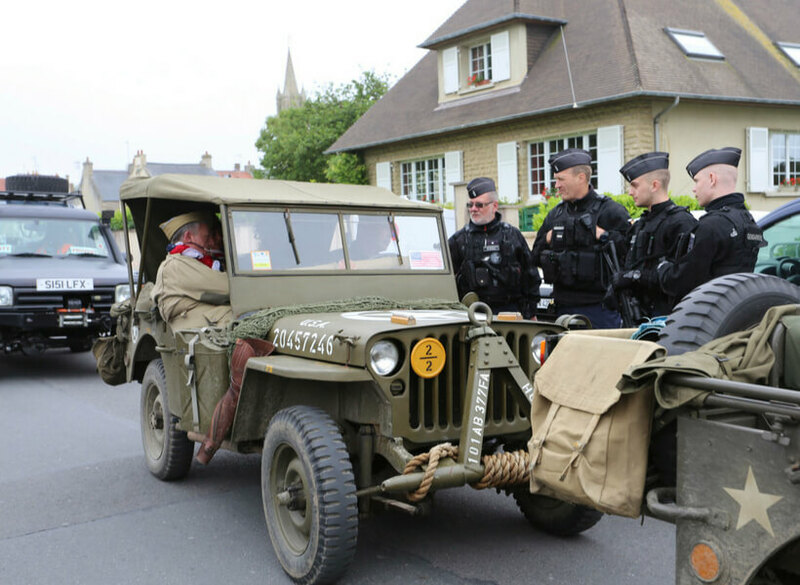 So they actually took that on June 6 and they consider that the first town liberated on D-Day. 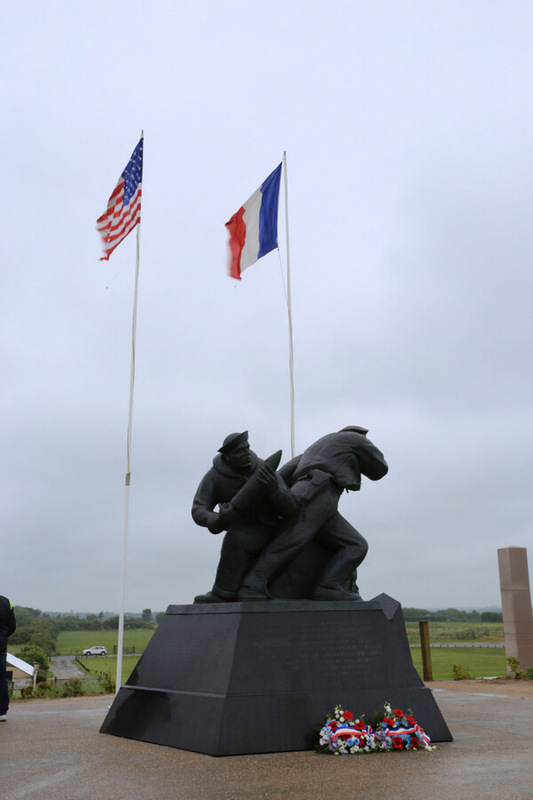 Phil: [00:58:57] Day while the hundred first airborne landed between them and the shore and they ended up linking up with the U.S. 4th division that came in from Utah Beach. They had that flooded area but they had these four causeways that were above the flooded area. And they were able to capture them and get the troops and get the tanks off the beach. And then the tanks and airborne hooked up. Phil: [00:59:19] So by the end of the day they basically had three footholds in France. There was a British Canadian foothold. 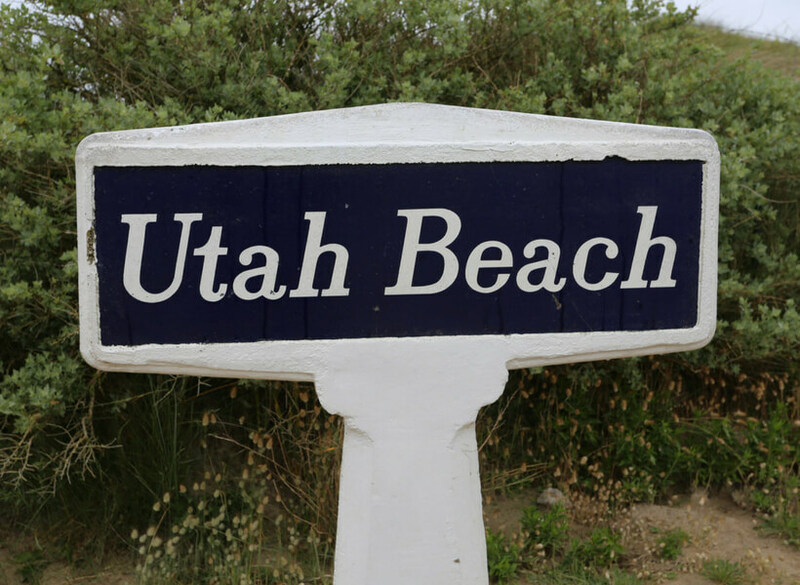 There was Omaha Beach and there was Utah Beach. But these three were not connected. So they still had to move inland. You know, it wasn’t all done on D Day. But they had to keep men moving in, they had to keep vehicles moving in. And I saw some stats that by June 11th which is five days later they’d landed almost a third of a million troops, 54000 vehicles (and these all came in over sea), 140000 tons of supplies. Phil: [00:59:56] And they had to keep that up for for quite some time. Phil: [01:00:02] Yeah. Wow it is all you can say. The more you learn about it the more you see see those areas. Annie: [01:00:09] Yeah this was not an easy take. They didn’t pick places where you could you know you just walk in and… No, it wasn’t anything like that. Phil: [01:00:21] Yeah. So there’s a lot of significant battles around. We talked about some. Omaha Beach with Bobby the bloodiest. There is a place to the west of there called Pointe du Hoc which is… It was a German gun emplacement or so we thought that was at the top of a cliff and we thought they had guns there that could basically reach Omaha Beach and Utah Beach. And there was no beach below it was just a cliff going into the sea. Phil: [01:00:47] And they had a U.S. Ranger Unit landed at the base of the cliff, fired hooks up the cliff with ropes, scaled the cliff. Now you’ve got defenders of machine guns and hand grenades. They climbed a cliff and captured this area. Annie: [01:01:03] And that… You have to be insane to do something like that. Or on drugs. I mean this kind of stuff you see in movies and in movies they make it look like oh it’s so easy. But they did it for real! Phil: [01:01:14] They did it for real and suffered heavily in the process. And because it took them a little longer. I think the plan was that the follow-up Rangers… When they… If they took Pointe du Hoc they were to fire a flare or… Or somehow signal that they had taken it. And then they know the follow up should reinforce them. If the follow ups didn’t get that indication, well rather than slaughtering more people they were diverted to Omaha Beach. And because it took them a little longer than normal, or it was either that or they had lack of communication they had no follow ups. 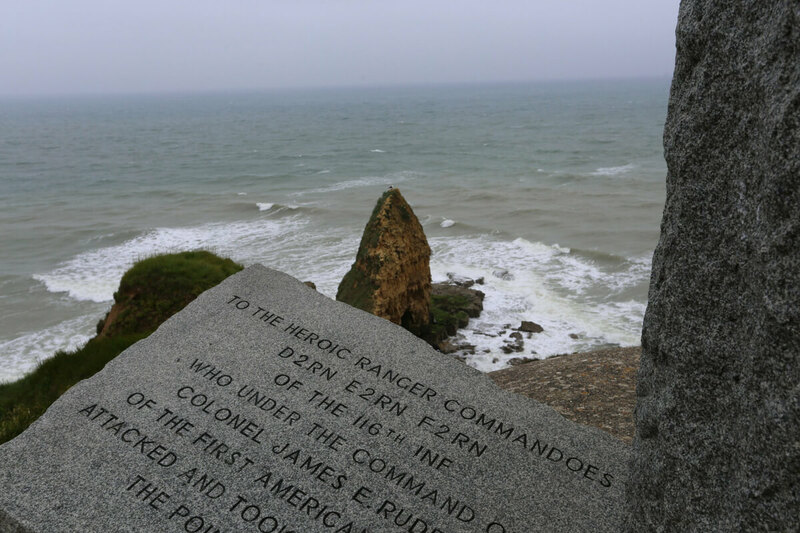 So the other rangers went Omaha Beach and these Rangers were at the top of Pointe du Hoc for I think a couple days and just had to hold that alone. Phil: [01:01:55] And if you go there today, it was heavily bombed the night before and proceeding D-Day. And you’ll see these huge craters gigantic concrete reinforced bunkers some are caved in, and some are not in huge craters. And you can look over the cliff and you can imagine after an assault this from the sea. Phil: [01:02:28] Fly them around. And that’s, you know, the bunkers themselves it’s kind of odd because these were, you know, evil military machines. And you think oh why would you bring a kid there? At least it is something physical there are the sites. Annie: [01:02:39] Yeah. By now it’s not evil military. I mean, you know what was there. But. Phil: [01:02:45] Yes. And you can even see it some of them like where the German soldiers lived. Because it wasn’t all sitting behind a machine gun turret, you know, they had to live and eat their meals and things like that. Annie: [01:02:56] And so, the biggest place to see that is Pointe du Hoc, right? Phil: [01:03:02] Ah, well, there are a lot of places Pointe du Hoc is big. There’s a lot of big gun emplacements north of Utah Beach. Phil: [01:03:08] In Azeville. And then there’s some over the British sector as well I forget the name of them. Annie: [01:03:14] Azeville, how do you spell than? Phil: [01:03:17] A Z E V I L L E.
Phil: [01:03:21] And that’s a great one because there’s there’s a lot of intact bunkers, intact rooms where the soldiers lived. Annie: [01:03:28] That’s got to be the one I remember then. Phil: [01:03:30] Yeah it’s it’s it’s… And it’s inland. You can’t even, you can see the ocean over the distant horizon, but you wouldn’t be able to fire with, you know, with direct eyesight that any ships out there. So they had to have people communicating from the shore. Phil: [01:03:44] There is one other battle that I want to mention because it was really fierce I think it was June 6, 7. Excuse me, June 7th 8th. And this was just to the west of Sainte Mère Église. I think technically it’s in Sainte Mère Église but there’s the Merderet river that flows west of Sainte Mère Église. Annie: [01:04:03] The what, sorry? Annie: [01:04:04] La Mer de Rai ? Spell it, spell it. Phil: [01:04:09] M E R D E R E T. I think. Phil: [01:04:16] And there it is big flooded fields on either side because the Germans flooded that. and It was just kind of flood plain anyway. And there was a bridge that they had to take. And at the time there were no trees on either side. So just approaching this bridge on these causeways you were completely exposed. And this was extremely important to the U.S. extremely important to the Germans and the eighty second Airborne was charged with taking it. Phil: [01:04:41] And a battle raged there for a couple days. You know, people were just so exposed from artillery and gunfire from the other side that either side would just get slaughtered on this. And they did eventually capture it and went on to the next town whose name I name I forget. But that kind of secured the western flank of the American Cotentin Peninsula. 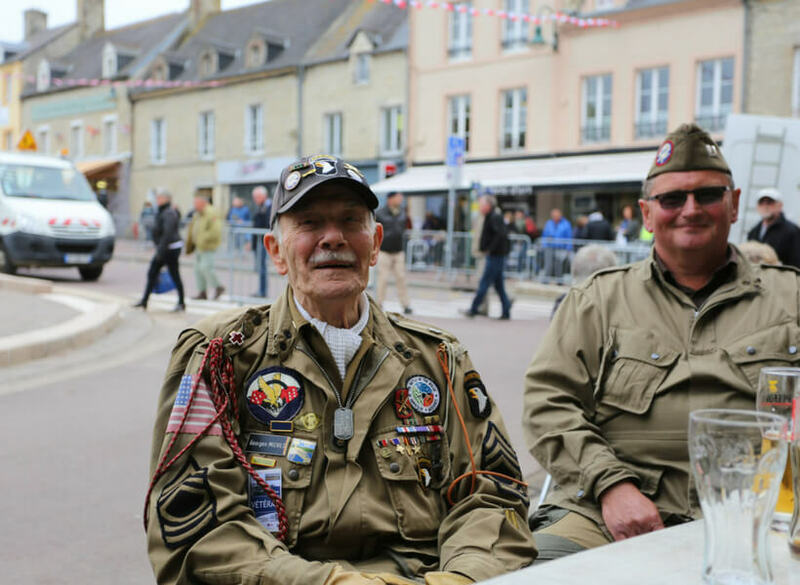 Phil: [01:05:06] And to this day on the anniversary of June 6th, or the nearest Sunday to that, there’s a big celebration there where the U.S. French and a bunch countries military paratroopers land right there on the river plain. There’s this huge hay field there and reenacters land there as well. And there’s a big audience, but you just have plane after plane of military landing there. Phil: [01:05:31] They once had the U.S. ambassador to France that a tandem skydive into that area. But it’s it’s appropriate for that. It’s appropriate because it was the battle with so much grit and determination that was taken by their soldiers. Phil: [01:05:49] Beyond D-Day, which I said we talk about maybe the week following, but I think we’ve covered a lot of ground just getting into details in the next day or two. But the battle still had to extend. They still hadn’t taken Caen until I think July 21st. They were supposed to take it the first day and it took almost six weeks to take that. Phil: [01:06:09] Carentan fell on June 12th St. Lo was sometime after that. So they get to these towns and have to, you know, that would be more of like Central Command Germans and they’d have to take these larger towns. And unfortunately a lot of those towns just got destroyed. Because there would be bombardments, there would be artillery. Annie: [01:06:29] Yeah, if you want to take a town you have to bomb it. Phil: [01:06:32] Yeah unfortunately that’s where a lot of the French casualties occurred. Caen was just wiped out, was just flattened. So many people died there. 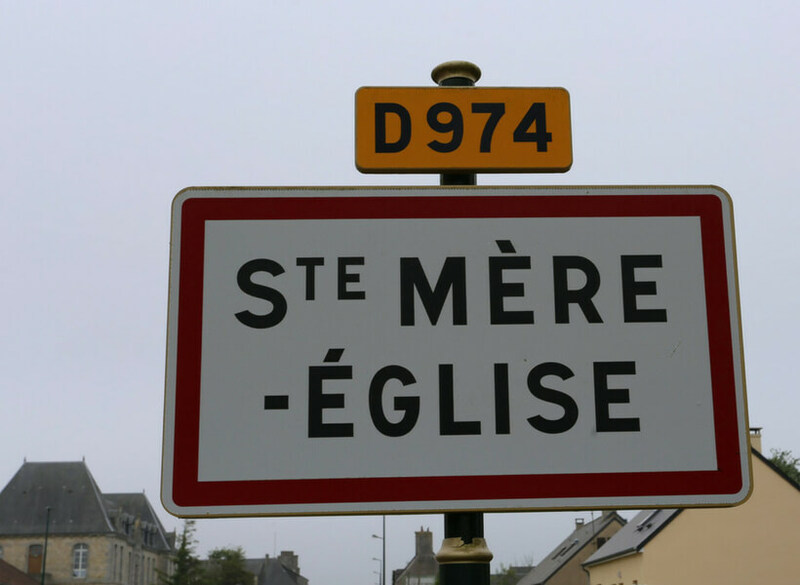 And one of the few towns that kind of escaped and it was a little smaller was Bayeux. And it still had a medieval half timber town and for some reason the Germans didn’t use it. And so it wasn’t bombed. It’s one of the few preserved ones. Annie: [01:06:54] Yes. Yeah it’s a good place to go see what Normandy looked like before. Phil: [01:06:59] Yes, yes absolutely. Phil: [01:07:03] So that’s that’s what I know about D-Day and the immediate aftermath of that. Phil: [01:07:09] It is really is amazing and when you look at some of the numbers they are truly amazing too. When you look at the entire Normandy campaign. So D-Day until August 21st when Paris was liberated. There are estimated to be half a million German casualties. About half of which were killed. American casualties were one hundred twenty, about one hundred twenty five thousand of whom twenty thousand were killed. English, Canadian, eighty three thousand casualties, 15000 killed. Phil: [01:07:41] French citizens: about 13000 to 20000 were killed and many more seriously wounded. There is a cost to war. And maybe we visit these places to remind us why we should do everything we can to avoid that sort of thing in the future. Annie: [01:07:56] Yeah. Yep. Wow. It’s surprising when you go to Normandy. The kind of gratitude you still feel and I don’t think they’re putting on airs. I think it’s all very genuine. Phil: [01:08:13] It really is. Annie: [01:08:14] Yeah. The people who you talk to the locals who you talk to just… They will tell you that they haven’t forgotten that it was amazing and that they are so grateful. There are still groups of people who notice that there are some American graves or British graves or whatever nationality that don’t get taken care of. And so they… There’s groups that get together and go put flowers and take care of graves and stuff. It’s it’s just amazing how much gratitude you can still feel to this day. Phil: [01:08:50] Yes. And it’s it’s not just people after your tourist dollars. I mean sure the restaurant you could be suspicious and say “Well sure they want the American Brits to spend money there” but you see it in people’s front yards. And on little kids bicycle’s and you know you’ll see a UK flag or a U.S. flag or something. Phil: [01:09:07] And these aren’t people, for the most part… I mean there aren’t many people alive that were still alive then. There are some Yeah. But you see gratitude from people that you know weren’t alive then, but obviously the stories have been passed down from their families. Phil: [01:09:39] And I think also the rural communities tend to be a little closer a little more dependent on each other than cities do. And most of Normandy is very rural. So you have a lot these organizations that I know you’ve mentioned before that it’s kind of a French thing to do to join an organization or group that gets involved in a particular activity or something. And there are a lot of organizations there that are really dedicated to remembrance of these events. Phil: [01:10:19] It was nice to see the appreciation. Annie: [01:10:21] Oh I was very surprised to hear one of the… They have these little tourists information kind of booth and the lady we talked to. I mean, I’m French so I speak French, and I was speaking to her in French and she said, you know,yes go see the American cemetery. Go see all of these things that we had planned, we had made a list. And also go to a German cemetery. Annie: [01:10:49] And I was like, really? And she said you will see how young they were. Annie: [01:10:58] And it’s shocking. It’s really shocking. I mean all of them were very young. Well, most of them. Phil: [01:11:02] Yes. I mean most soldiers in general certainly infantry you know front line soldiers were young but some of the Germans were you know it would be too young even to legally be a soldier. Annie: [01:11:11] Yes, well some of them are 16, 17 you know. Phil: [01:11:14] And there’s a big German cemetery in I think it’s called La Cambe. It’s right off the large “autoroute” between Omaha Beach and Utah Beach. Phil: [01:11:23] And you can see the entrance. And so a lot of people visit it to see what that’s like. But I went to another one once that was a lot further west than Sainte Mère Église. In a town, I’m just doing this by memory, Orglandes, O R L A N D G E S, I think. Annie: [01:11:39] Say that again? Phil: [01:11:40] O R L A N D G E S.
Annie: [01:11:46] [Addendum: It’s actually called Orglandes]. Phil: [01:11:48] I think that I’m just doing this from memory so I may be misspelling. Phil: [01:11:51] But there are much fewer people there. It was very sobering. And what they had is they… Rather than, like the US and UK cemeteries, where there’s one stone, one marker per soldier they six soldiers were murdered in the German. And very often four out of six would just say in German unknown German soldier””. They didn’t even know who it was that they buried there. 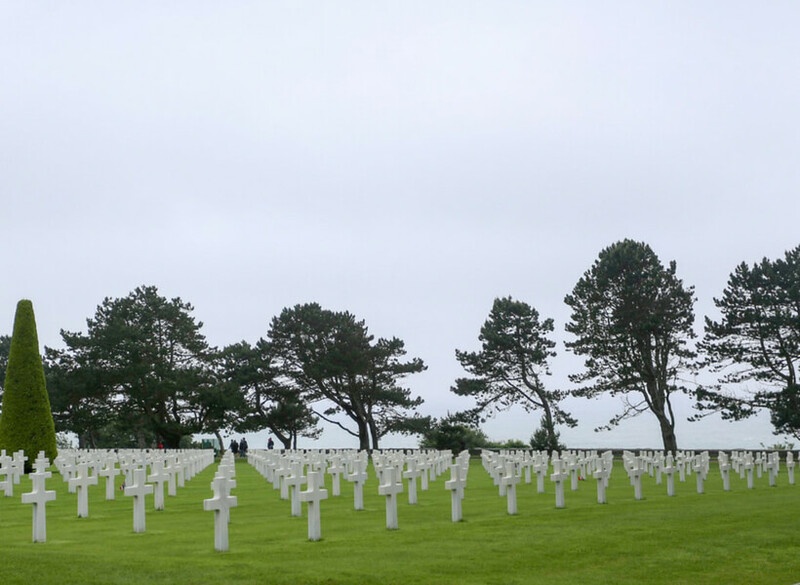 Phil: [01:12:17] And they had the U.S. Normandy’s cemetaries is just shy of 10000 soldiers buried there. The one down on the Brittany border is about 5000. That German one has 20000 soldiers in it. And I think the one by the autoroute near Omaha Beach also has 20000. Phil: [01:12:53] No, you’re allies. Phil: [01:13:00] But part of that may be because people look at these lessons. Phil: [01:13:05] And try not to repeat them. Annie: [01:13:06] Yes. And that’s one of the big reasons why there were politicians in Europe not very long after World War II who started saying we have to build a European Union. Because that’s the only way to avoid regular this sort of war from coming back again. Because it wasn’t, you know, World War II was not the first time this happened between France and Germany. It happened in World War I, it happened in 1878 I think. It happened before you know. It was just something that just happened over and over again. And we don’t want that. Phil: [01:13:40] And has all through history all over the world. Phil: [01:13:42] But look at it the more you learn from it the more you try to understand the other side, you know, hopefully… I’m not going to say that we’re going to get rid of all wars going forward. But if you you can at least reduce them that’s a that’s a benefit and that starts with education. Annie: [01:13:54] Yeah but if I can get just a tiny bit preachy you have to be careful with ideology. Because a lot of countries these days tend to vote for people who are very good at riling people up. And and I’m saying in Europe too. And that’s very dangerous, you know. Phil: [01:14:14] It can be. Annie: [01:14:15] It can be very very dangerous because the Germans by now have admitted that there was an ideology that was really attractive to them. Because it put them high on a pedestal. It made them top of the world, you know, and people like to be top of the world. I mean they you know. Phil: [01:14:33] But another part of that too is that it’s easy to rile people when they feel like they’re at the bottom of the world. And WWI basically begat World War II. Because the treaty of Versaille put such onerous punishments on Germany. Phil: [01:14:49] That’s, you know, they just felt like well we have nothing else. You know we can’t possibly succeed this way. So when you hear a guy like Hitler Donio there’s another path. You know they went to believe him. Phil: [01:14:59] And that was one lesson from World War I that was played out after World War II when they had the Marshall Plan. Phil: [01:15:07] But it was like we can’t just leave these countries beat down in poverty because they’ll just rise again to battle. Phil: [01:15:14] So we invested in what had previously been our enemies in Germany in Austria and Japan and now they’re some of our best allies. Annie: [01:15:24] That’s right. So that’s right. So let’s let’s hope that nothing like this ever happens again. I don’t think it could happen like it did on D-Day. But but it’s just stunning the sacrifice that people made and that the… The effort like it was like oh the only thing that mattered to these people was to push the Germans out and they gave it their all. Phil: [01:15:50] And many lost in the process. But overall overall they succeeded. Yeah. Annie: [01:16:16] A little bit tedious and dated to get through. But really, if you are going to be visiting the area and you’re somebody who likes history I think you would enjoy reading or or watching the movie and getting a feel for what it was like. The visuals of the movie are pretty stunning. Phil: [01:16:34] And I think that was how this podcast this episode came about is that I’ve seen so many people go over there and I just know that the more you know about what happened the more you will get out of your visit there. Annie: [01:17:05] Yeah because today it looks quite peaceful. I mean you know there are still remnants of… But it’s a peaceful place. Annie: [01:17:36] It probably was. Phil: [01:17:36] I mean if you think what had happened if we hadn’t conquered Germany. Phil: [01:17:40] And if you think if D-Day didn’t succeed there a good chance that we wouldn’t have conquered Germany and we would have sued for peace and they would… would have still been in power and maybe still be in power today. There or other huge battles in World War II. But I think, I can’t think of another one that… Another one battle that changed the course of history as much as this one. Annie: [01:18:00] Yeah. All right Phil thank you so much for taking the time to do all this prep work you can see Phil’s notes on on all of these and see all these things written out. It’s going to be on https://joinusinfrance.com/201 fourth slash one ninety nine. I think this is one where I will get it transcribed as well. It might not be ready right as soon as I published the episode but the transcription will be there because a lot of people want to to refer back to that. Phil: [01:18:32] Good good. And enjoy your trip. I know you have one coming out to Paris and to Normandy. Phil: [01:18:37] Enjoy your trip and give Normandie my regards. Annie: [01:18:39] I will do that. I will… I will sprinkle some good thoughts from Phil and in return hopefully it will come back to you and you’ll go back to Normandy very soon. Phil: [01:18:52] I hope so great. Phil: [01:18:55] Thank you Annie! Phil: [01:18:59] Bonjour Annie.. This is Phil Roberson. I know you spoke with me a few hours ago, but you need to learn that I’m the type of guy that always thinks of what I should have said. And there’s one thing that I really missed out on on our talk this afternoon. Phil: [01:19:12] So one of the most interesting parts of the Battle of Normandy was the need for harbors. And we talked how they didn’t land in Pas de Calais which had a large harbor and the next large harbor was Cherbourg which is also fortified. They didn’t land there. But they still needed to land men and materiel in Normandy to keep the resupply of the army marching across the land. Phil: [01:19:36] So one interesting thing is they developed this thing, and this was actually Winston Churchill’s idea, called The Mulberry harbor. And this was an artificial prefabricated harbor that they hauled across the English Channel piece by piece. 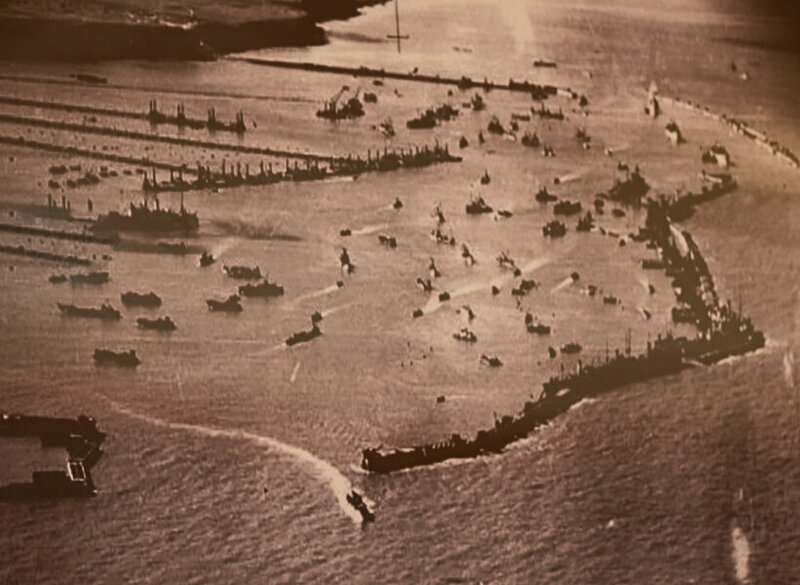 They took old ships and sunk them to create a breakwater and then they had these huge concrete caissons that were sunk and filled with water and sunk once they got to Normandy. And then had floating bridges that lead from them to the shore. And this way they could use Omaha Beach and Gold Beach as artificial harbors where they would dock large ships. Dock them right to this artificial Harbor Drive off vehicles across these floating pontoons and bring them all the way to the shore. Phil: [01:20:24] And it was a real important part of the resupply effort. And there are still at Sword Beach, excuse me, at Gold Beach, remnants of those harbors that are scattered on the beach. And the caissons way out at sea you can still see towards the horizon. At any rate, it’s a very interesting story. Very interesting part of the Normandy operation and I don’t know if there’s any way to add this or if we had five minutes to talk about it or you can do your own research and talk about it but I think it’s very interesting. Phil: [01:20:58] Number one in that it was instrumental in the resupply of the troops. And number two in that you can still see these remnants out at sea when you visit Gold Beach near Arromanches. And there’s even a little museum all about it at Arromanches that has a replica inside, a miniature replica, inside the museum. And you can look at that and look out the window and see these huge floating parts of these… Really floating vehicular roadways that are still strewn out in the sand on the beach. So that’s it. E-mail me or call if you want to talk about it further or add your own comments. But I really think it would add to the story of the Battle of Normandy. Phil: [01:21:41] Take care. Have a good trip to Paris and to Normandy. Annie: [01:21:48] I’m recording this intro really close to the previous one. As a matter of fact two days later so still no new patrons to thank but I love you current patrons to support the show on Patreon go to https://Patreon.com/Joinus. P A T R E O N. And join us is without spaces or dashes and thank you so much patrons. Look for several rewards coming up your way. Look for several rewards coming your way in July patrons. 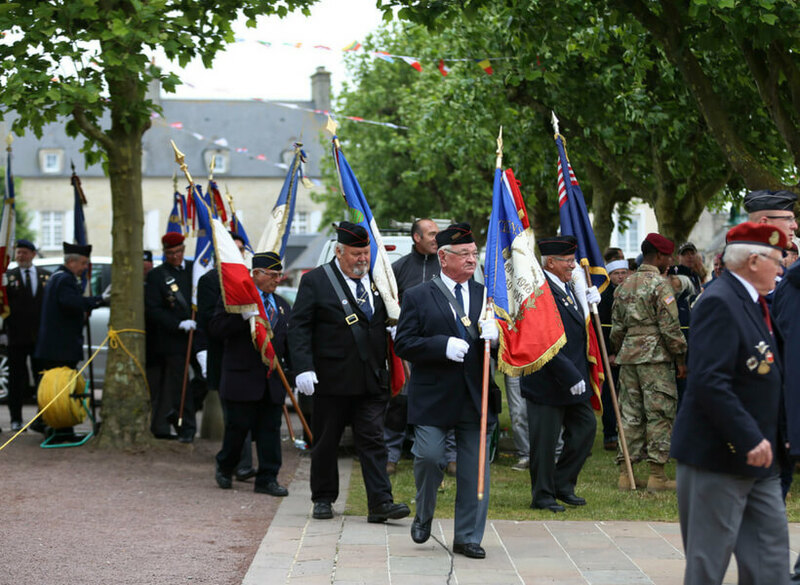 Annie: [01:22:26] And speaking of Arromanches-les-Bains, I was just there for the 2018 D-Day celebrations. It was lovely to see all the veterans, the military personnel, the ladies dressed up in period dresses and makeup and hair, it was really lovely, festive. And you can see some of my pictures on https”//joinusinfrance.com/201. But I have to say if you want to attend the D-Day celebrations in 2019. A lot of the hotels I talked to were saying that they were already fully booked for those dates. 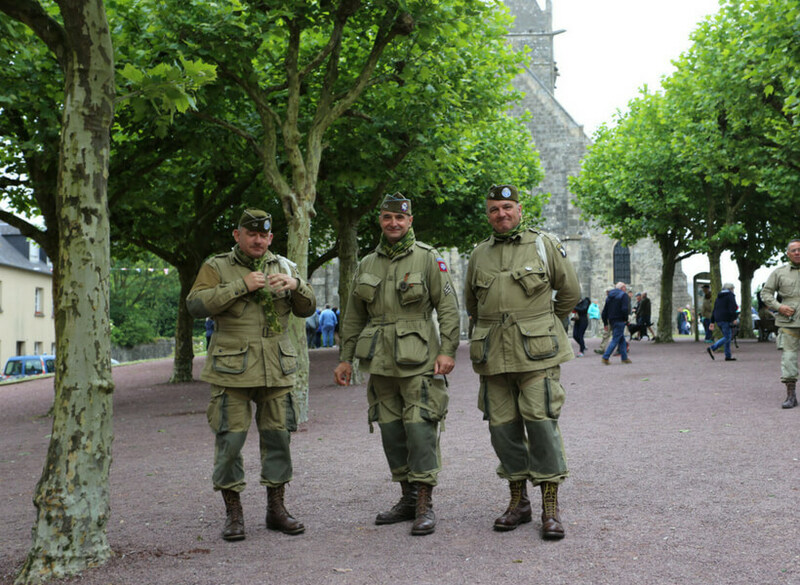 So to be in Normandy for D-Day celebrations. This is the sort of thing that you have to plan at least a year in advance and possibly two years in advance which is kind of ridiculous. Annie: [01:23:14] But Normandy is not a place that has millions of tourists. Generally speaking, well it does over a long time. And a lot of them want to come, you know, right at the celebrations and so they run out of hotel rooms. Annie: [01:23:32] I would love it if you would share this episode with people you know who are going to be visiting Normandy. Join Us in France is available on your Alexa’s smart speaker, on your smartphone using Spotify, iTunes, Google Play, or with any number of podcasts apps. The one I use right now is called Castro 2. Annie: [01:24:00] I know there’s a Castro 3 but I haven’t upgraded to it because it’s one of these dreaded subscription models. So I’m not sure I’m ready for that. But there’s lots of great options out there to listen to podcasts. You can even listen on the Join Us in France website which is the easiest way. Annie: [01:24:21] And my goal for the summer is to launch the new version of the site because it looks great. It’s much better than the old one. The information is organized better and if put effort into the writing which I normally don’t have time to do. But I forced myself, you know, just do a little bit with the English writing. And as you know english is not my first language and so sometimes it’s a little hard for me to be super creative with writing in English. Annie: [01:24:49] Anyway thank you for spreading the word around you about Join Us in France it really helps and it will help your friends too. Annie: [01:24:59] To connect with me. 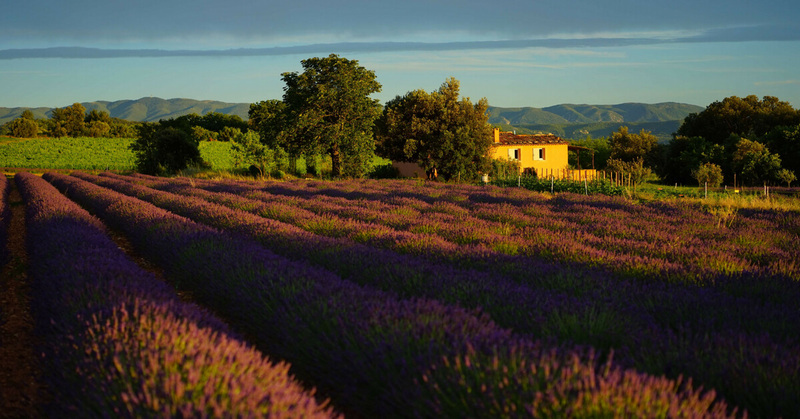 Email annie@joinusinfrance.com or leave a message at 1 8 0 1 8 0 6 1 0 1 5. You can also ask to join the Join Us in France closed group on Facebook. And when you do answer the questions or I won’t let you in. Annie: [01:25:23] Have a great week of trip planning and I’ll talk to you next week! Au revoir! Steve: [01:25:28] Hi Annie, it’s Steve, I was on your first tour a year ago. Looks like you’re on another one right now. Congratulations, hope it goes well! Wanted to just call just call and say thank you for the food prices. But I just listened to her yesterday. You know I live here now, I’ve been here over year it was still pretty beneficial. Steve: [01:25:51] Gave me some tips on things to look at things I’ve passed right by. So I’m pretty pushy all the effort you put into you really set some time on this one. Anyway I hope the tour goes well and I’ll keep listening! [01:26:05] The Join Us in France Travel Podcast is written and produced by Annie Sargent and copyright 2018 by Addicted to France. It is released under a Creative Commons Attribution Non-Commercial No Derivatives License.